After writing an article on how to venture into catfish smoke-drying business, I have been getting emails and calls from intending farmers asking me if catfish processing(smoking and dring) is profitable. They go on to ask, "Is it worth the stress?". People really want to know the profitabilty of catfish smoking business before they go into it. 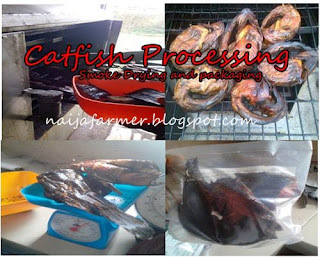 Catfish processing business is very profitable. Catfish processing business is a form of value addition which majorly involves cleaning, brining, smoke- drying and packaging of catfish and distribution/marketing. Here in Benin city, a kilogram of live catfish at commercial catfish farms is about N650-800 depending on the size and quantity you want to buy. The price generally depends on the quantity you buy, the larger the cheaper it gets. Packaged smoked dried catfish costs about N2500-N3,000 depending on quality, level of dryness and marketing. Some processors sell up to N3,500 or N4,000 depending on the branding, packaging, marketing and target customers which are usually elites or special customers. It takes about 3kg of fresh catfish to get 1kg of smoked dried fish at an acceptable moisture level. More maybe needed for more dryness and these are special orders or for export. So, lets assume you bought 100kg of life catfish at N65,000 at N650 per Kg(could be lesser). So, lets assume after processing you get 33kg (that is 100kg divided by 3). If you supply retail at N2,500 you'll get N82,500( That is N2,500 multiplied by 33kg ). You even make more profits if you do retail sales(direct to consumers) as you can sale higher than N2,500 but you'll have to make your price competitive. Let's assume expenses is N7,500. cost of packages, seasoning and charcoal and transport to wholesaler. Note that price of 1Kg catfish varies from city to city, locality to locality, market to market. You know that price at elitist market is higher. You make more profits by keeping price low and selling at a good price and also increasing your scale of production. Generally, it will cost you less than ₦100 to process and package it. You can sell it to wholesaler or supermarkets at N2500 or more who in turn sell it to their customers at N3,000 or more. Or you sale directly to consumers at a higher price to make more profits. This depends on how much you are willing to invest, your scale of production( that is rate of production), target market, and cost of production. however if you process 100kg of live catfish everyday and make a profit of N10, 000 per batch, you will make N300,000 in 30 days right provided you do you have good target market and marketing strategy. You can make more if you increase scale up production. The amount of money you can earn in a month all depends on your capacity. There is a huge market for hygienically smoked catfish both here and abroad, but you can hardly meet the market demand in the country talk more of exporting. With good market strategy you will attain success. Like, share and comment and subscribe below with your email for more agribusiness articles like this.